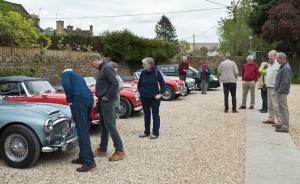 Each year the Federation of British Historical Vehicle Clubs (FBHVC) promote the use of historic vehicles by encouraging all clubs to take part in a “Drive it Day”. 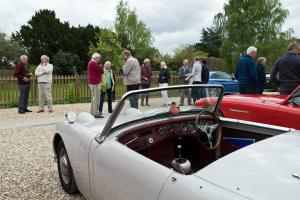 This year was on 23rd April and with excellent weather, many classics of all types were to be encountered on the road. For our part, we converged on the Alain Rouveure Galleries just off the Fosse Way at Todenham near Moreton in Marsh for a complementary tea/coffee and a chance to explore the gallery and craft shop. The gallery turned out to be most fascinating with many relics from the Middle East. 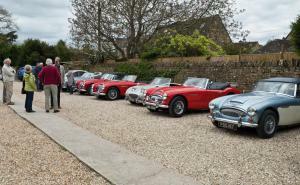 Next we headed off to Bourton on the Water for an excellent lunch at the Dial House Hotel, this followed by a walk round the town and a visit to the Cotswold Motoring Museum just across the road. During this time there was a steady stream of other classics passing through the town. Our thanks go to David and Be Broughton for organising the event.